There are a lot of cool little novelties that you can buy depending on your tastes or interests, but there are few novelties that can lay quite the same claim to the title of “Cool” as novelty money and fake money can. Fake money is essentially any type of money that is not legal tender. Fake money can appear as bills or coins, and they come in all different shapes, sizes, and styles. Fake and novelty money are used as gag gifts, as real gifts, personal items and mementos, trinkets, party favors, and as random “Thinking of you” gifts. People even collect fake money too, not only in the styles of their interest but in other styles to amass a collection of the unique and varied bills. Fake money also appears as toys for children, though adults have just as much fun with these cool little bills as kids do, if not more fun. Fake money can be traded amongst friends very easily, as each bill intrinsically holds the same value as no single bill costs more than any other bill. Fake money has many different uses. Fake and novelty money comes in hundreds of different prints and types, so it is a guarantee that you can find something for everyone. And that right there is one of the best uses for fake money, as gift ideas! This is a great way to buy a lot of gifts for a lot of different people, all at the same place (don’t we just love when we can do that?). Fake money is also great as a party favor or as decorations for a party. It can be used as a way to increase your social status in the workplace as well when you walk around the office giving all of your co-workers a cool novelty bill. Novelty money is also a great gift for yourself. Have a particular taste or fancy? Odds are we have it here at Fake Million. We have some of the best selections of novelty money out there. We have dozens of different categories of novelty money, with several different types of bills in each category. Any classic car enthusiast can get excited about trinkets that remind them of their favorite cars and everyone likes money too, so these novelty bills with classic cars printed on them are the perfect combination! Classic car novelty money is a great way to remember a car that one once had, or as a way to remind them of the classic car that they hope to one day get! Where Can You Buy Fake Money? Where can you buy fake money? Right here at fakemillion.com. Fake Million is the premier, leading business in everything fake money related, offering a huge selection of different styles and types of fake and novelty money. We offer great prices for our products, and we offer combinations on shipping of different items too. Furthermore, if you do not see a bill style on our site that you want (although highly unlikely and we dare you to try), just reach out and contact us. If we do not have it, odds are we know where to get it and would be happy to track it down for you. 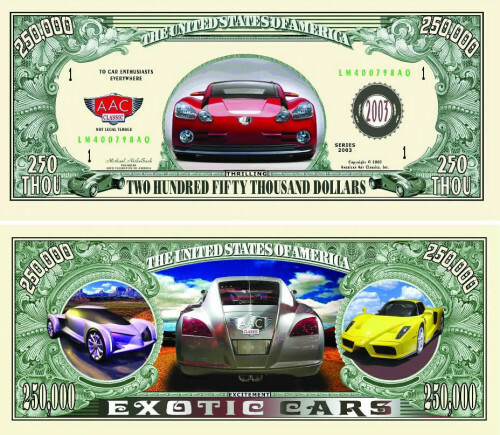 Our Exotic Car novelty money is printed on the front and back. It is the same size as real US currency. The Exotic Car Dollar Bill is beautifully designed. Use these Exotic Car Dollar novelty bills in schools, at parties, sell them at retail stores, sell them in online auctions or use them in promotions. Our Exotic Car Collectible Dollar Bills make for a great gift or collection item. All of our novelty money, funny money and fake money is extremely popular and can be used in hundreds of unique and fun ways. ALL OF OUR NOVELTY BILLS ARE 100% GUARANTEED TO BE THE BEST QUALITY.